One of the first things I had to do when I got my admission letter to a graduate program at UIC was to figure out if my wife and I could afford for me to go to grad school. I’m sure almost all of my colleagues have been in this situation. For me, as long as I continued to work part-time in addition to all my grad school duties, I would be able to pull it off. In my particular situation, my income is the family income. Therefore, being able to work outside UIC in addition to holding an assistantship is crucial to being able to continue my graduate studies. I certainly do not think I’m alone in this. My partner and I certainly do not live extravagantly; for most of my first year of grad school, we lived in an apartment that was about the same size as my freshman dorm room in undergrad. We try to keep our costs down however we can. This is grad school – we expected to have tight budgets. 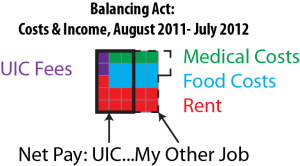 However, as this graphic shows, even the necessities (rent, medical costs, food costs, and the fees that I had to pay to UIC to attend classes) overwhelmed what I was bringing home from my teaching job at UIC. Factor in utilities and incidental expenses (not included in the graphic), and there’s only one conclusion: I had to work off campus. I was lucky to land a part-time job in my field that is helping to prepare me for after I graduate. My employer understands the nature of school, and is flexible with me with scheduling. Many of my colleagues find themselves in less advantageous arrangements, and balancing this outside work is very difficult. For all of us – balancing coursework, our TA or RA duties, and our research with outside employment is unquestionably difficult. This has led to many departments discouraging grad students from taking outside jobs. However, as my chart shows – for some of us, there is no option. This is why we need a contract, and need it now. First, the uncertainty of not having a contract makes the planning that I have to do to balance all of this even more difficult. Second, a new contract needs to have stronger protections for students that need to work off-campus. Finally, a new contract needs to recognize that UIC does not pay its graduate employees enough to live in the city where the campus exists. The bottom line is that the University will go on and on about being a world-class institution, but cannot do so if many graduate employees cannot afford to get a graduate education. This is the trend of the status quo – it is up to us to bring about the necessary changes. 2nd Mediation Session with the University This Wednesday, December 5th! With the mediator in place, we’re on to our second session with the university from 10 am-4 pm in University Hall room 650! This means going over some of the items we’ve previously tabled (such as Additional Employment, Leaves and Holidays, and No Strike clauses) in addition to working our way towards financial issues (slowly but surely). It’s going to be a longer session so even if you’re able to stop by for a little bit, it’s a great idea to have a rotating number of people attending to keep up the visibility. It’s your contract so come on over!